The Hideaway at Broadstone Barns in Ticknall, near Derby, Derbyshire sleeps 2 people. Broadstone Barns near Derby are three, unique terraced barns (refs UKC3844, UKC3845 [The Retreat] and UKC3846 [The Lookout]) which have been converted into exceptional holiday homes, featuring huge bi-folding doors and big windows throughout the property to enjoy the fabulous uninterrupted views. With their own private driveway you’ll feel as though your holiday has begun before you even step foot into your accommodation. You will be greeted by open plan living and kitchen areas, wonderfully designed rooms flooding with natural light. The kitchen area boasts modern appliances, islands and granite worktops, whilst the living area has been furnished to a high standard and exhibits local artist’s creations throughout. Bathrooms are pure heaven with freestanding baths together with large walk-in showers with tiled floors. Cleverly designed bedrooms offer luxury, and designer lighting sets the perfect tone, so slip into the complimentary bathrobes and slippers and unwind. Who wouldn’t enjoy their own private south facing terrace along with furnishings and a private hot tub to relax in? Venturing directly from your doorstep you will find great walks to enjoy if you can drag yourself away. Situated in the small village of Ticknall in south Derbyshire you will find the village store and local pubs to enjoy. Close by, Melbourne has a wealth of pubs, restaurants and an amazing array of independent shops. Further afield you can visit the National Trust Calke Abbey, a historic house within a 600-acre nature reserve, or Staunton Harold Reservoir with its yacht club and children’s activity play area. The largest inland marina in Europe, Mercia Marina, can be found just 4 miles away at Willington, not to mention Donington Park which has a museum on site with the Grand Prix collection, as well as hosting major motorcycling and racing events. When it’s not being used for racing, the race track hosts the yearly Download Festival. Ideally situated on the edge of The National Forest, you can enjoy walking, bird watching and cycling galore. Travel a little further and you will be greeted by the beautiful Peak District, with its historic houses such as Chatsworth and Haddon to name a few, alongside Bakewell, Matlock Bath and Matlock. After a day of exploring the area you’ll be excited to get back to Broadstone Barns, fully equipped with all the comforts you’ll need to enjoy your special break. You will find the shop, pub and restaurant all 1 mile from Broadstone Barns near Derby. These properties can be booked together to sleep up to 10 people. The Hideaway is all on the ground floor. Living area: With Freeview TV and bi-folding doors leading to courtyard. Bedroom: With super king-size bed and en-suite with bath, walk-in shower and toilet. All properties: Gas central heating (underfloor in open plan living space), electricity, bed linen, towels and Wi-Fi included. Travel cot and highchair available on request. Welcome pack. Enclosed courtyard with patio and garden furniture. Hot tub (private). Bike store. Private parking for 2 cars. No smoking. Holidays at The Hideaway, Broadstone Barns run from Friday to Friday. For a better idea of where Broadstone Barns - The Hideaway is, you can see Broadstone Barns - The Hideaway on the map below. Broadstone Barns - The Hideaway is in Derbyshire; should you be on the lookout for a special offer, you can find all the special offers in Derbyshire. It's always worth checking to see what is on offer at the moment. 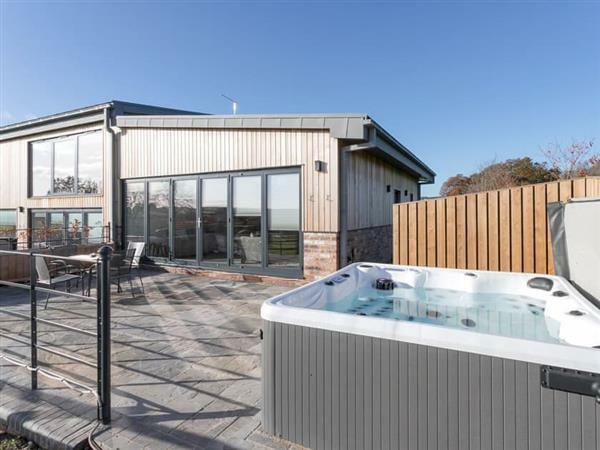 Do you want to holiday near Broadstone Barns - The Hideaway (UKC3844), you can see other cottages within 25 miles of Broadstone Barns - The Hideaway; have a look to find your perfect holiday location.